“When Siddhartha listened attentively to this river, to the song of a thousand voices; when he did not listen to the sorrow or laughter, when he did not bind his soul to any one particular voice and absorb it in his Self, but heard them all, the whole, the unity; then the great song of a thousand voices consisted of on word: Om-perfection. 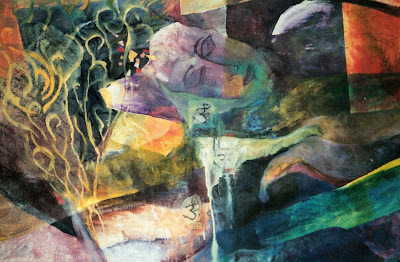 I created the painting above a number of years ago after reading Siddhartha by Herman Hesse. The book evoked so many powerful visual images for me that I felt inspired to create a piece of art in response. The passage that I shared above is the part of the book that stayed with me, long after I had put the book down. I wrote the passage on transparent paper and incorporated the text into the piece as well. 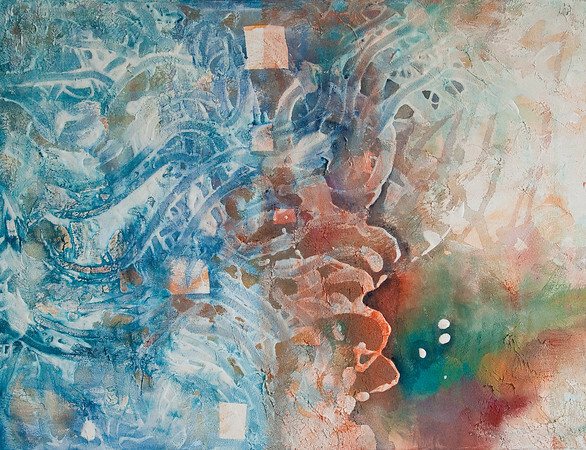 While creating this piece I let myself surrender to the stream of the creative process, as I layered color and collage and let the composition create itself. 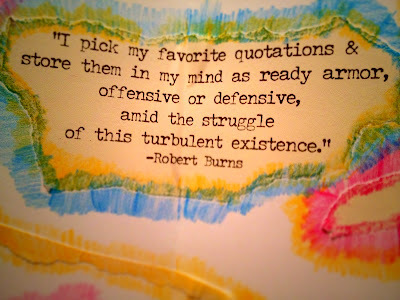 Fast forward 15 years or so…During my last art therapy group, a number of the clients began incorporating words into their art pieces. One group member created an abstract layered painting on canvas, and then carefully stenciled the words “We are one, Love.” Another client made a piece that reflected her favorite passage from the bible – a passage that had brought her strength during difficult times. One woman spent the time writing a poem about what love means to her and then shared it at the end of group. I was fascinated by the spontaneous addition of words to the art process and began thinking about the relationship between writing and art therapy. A few months ago I had attended the Expressive Arts Therapy Summit here in NYC and had attended a workshop led by art therapist Erin Partridge, titled Personal Hope Book: A Container of Resilience. The workshop included a discussion about Erin’s work in a high security prison setting, with treatment-resistant men. Erin found quotes about hope that resonated with the group members and was able to engage the group members in the process of creating “Personal Hope Books” where each page in the individual’s handmade book included a quote about hope and accompanying art work. Before group, write feeling words on single pieces of paper (such as sad, joyful, ashamed) and put them in the center of the table. Ask each group member to select a word that reflects what they are feeling at the moment and then create a piece of art that visually represents that feeling. Or, ask them to create a piece of art that represents the opposite of the feeling they have chosen. Provide the group members with a number of printed out quotes around a certain theme (such as the hope quotes mentioned above). Ask them to incorporate the quote into a collage/mixed media piece. Chain story/mural: (Great warm-up activity too!) Have the group members participate in a chain story – where each person writes a few sentences of a story and then folds the paper down so that only the last part of the sentence can be seen and then continued by the next person. When the story is finished it can be read aloud, and then a group piece (such as a mural on paper) can be created to depict the story. Transforming stress: (This is an idea that I created a little while ago after one of my clients brought an entire pile of bills/forms to our session and dumped them on the table!) Have the clients bring any forms, bills, etc. that are stressing them out at the moment and then make photocopies of them. (Just be sure to block out any personal info on the forms). Then, have the clients create a “stress collage” with the photocopies. 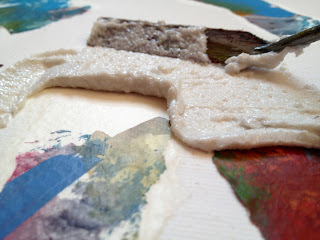 Encourage them to get some frustration out by ripping, cutting-up, and layering the copies and to add color (with paint, markers, etc) to the piece. Additional words can be added on top of the photocopies. One final note: Be mindful of language barriers and/or the fact that some clients may struggle with reading. This can be handled, (without drawing any attention to the client) by simply reading the quotes/words out loud at the beginning of group and arranging them in a way on the table so that the client(s) can differentiate between them clearly. I’m excited to share the title and description of the workshop that I will be teaching during the upcoming 6 Degrees of Creativity 2 online workshops! When was the last time you gave yourself complete permission to simply play with art materials and get lost in the exploration process? Textural art naturally entices viewers and artists alike and invites interaction and spontaneity. In this workshop you will be introduced to a variety of techniques for creating texture in your art using acrylic mediums, modeling pastes, gels, and palette knives. 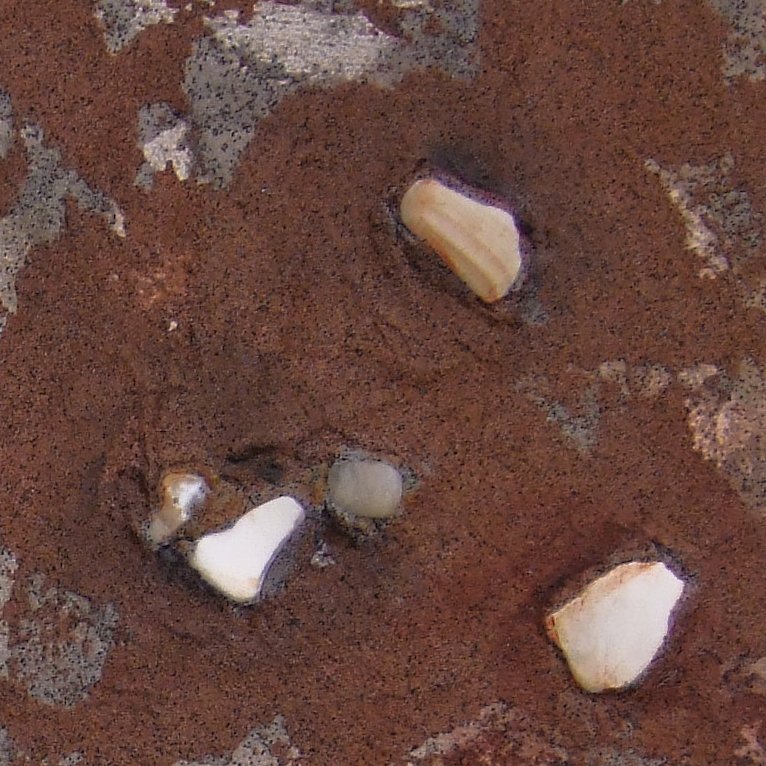 You will create textural ‘playgrounds’ for your paint to travel through with the layering of textures, colors, found objects, and any other materials that inspire you. The experimentation process with texture will be framed by suggested ideas and directives that are designed to delight and inspire the eternal child within you. In this workshop, the process and play drive the work of art. I have been utilizing texture pastes within my paintings for a number of years and am constantly delighted by the process! I am thrilled to be able to offer this workshop and looking forward to sharing inspiration, creativity, and art-making with you! Here are a few examples of pieces that I have created over the years using texture pastes, collage, and other mixed media techniques! 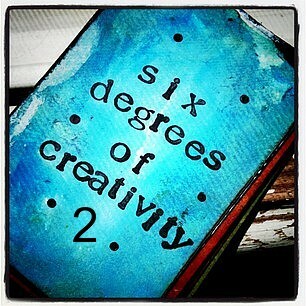 Enjoy and stay tuned for information on registering for 6 Degrees of Creativity 2. 6 Degrees of Creativity is a unique online workshop and community with a goal of inspiring and supporting the artist within as you tap into your creativity and build meaningful connections. We often work alone in our studios or in our role as therapist (or art therapist!) Here is a chance to tap into a creative community, replenish yourself, get inspired, and collaborate! This round of 6 Degrees of Creativity will start July 1, 2012 until December 31, 2012. More details about registration and workshop descriptions to follow!